Bed Fleeces - Pure New Wool Or Polyester Options. 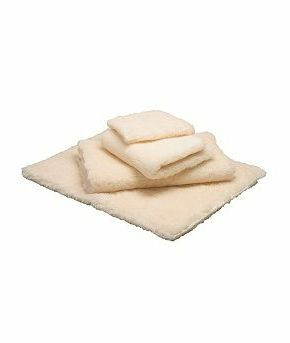 The benefits of these pressure relieving fleeces are well documented, they provide warmth, reduce the incidence and severity of pressure sores and generally improve comfort. They are available in Pure New Wool Or Polyester and in various sizes. Ankle Pad 15" x 30"
Hip/Shoulder Pad 27" x 30"
Narrow Single Bed 27" x 60"
Standard Single Bed 36" x 60"
Double Bed 54" x 60"
The pure new wool fleece is wonderful .A great nights sleep from the start .It is lovely to sleep on,not too hot as I first thought it may be .The comfort is unbelievable .I wish I had bought one ages ago I have osteoporosis and suffer from painful symptoms ,so a good night\'s sleep is a real bonus . This wool pad is lovely for my hip. It gives me great relief. My father says the fleece is comfortable and is helping his sore heels and ankles but he finds it difficult to keep it in place during the night. The larger size would probably have been more successful. The item arrived very promptly, was nicely packaged and was exactly as described. The quality was excellent and I consider it very good value for money. I will have no hesitation in ordering again. Mum is very pleased with this- exactly what she needed to pretect her heels in bed.